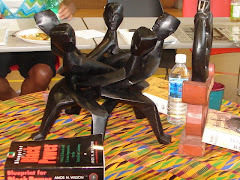 In Fall 2007, BCAN-Peel was granted $75,000 from the Ontario Trillium Foundation to complete a sociodemographic profile of the African/Caribbean community in Peel Region; a Community Needs Assessment of the African/Caribbean community in Peel Region; and an Asset Inventory of Peel based community agencies serving the Black Community. BCAN-Peel was pleased to hold our Network and Research Launch on Thursday, June 5th, 2008 at the Holiday Inn in Brampton. Over 100+ service providers and community members came together to celebrate the launching of BCAN-Peel, and to view a formal presentation of the socio-demographic research conducted on BCAN-Peel's behalf, by the Social Planning Council of Peel.